Just like wolves of the forest, moorland harpies still honour the old pact with the Martyred King. In times of war, they will fly to Folda's aid. Folda armorial bearings from a pre-Ostrom armorial. A crowned harpy is on the ghoul kingdom's coat of arms. Has been since long before the Ostrom. However, now in the post-Ostrom age the bird's golden crown has been replaced with a wreath of thorns, to honour the Siege Martyrs and stand as reminder of their sacrifice. 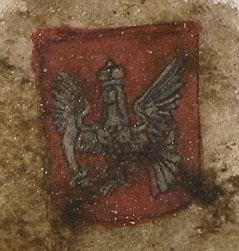 Post-Ostrom depiction of Folda's national emblem in an illuminated breviary. It's always bats with vampires... So I said to myself: let's try something more exotic. I considered giant ravens for a bit, but that also seemed a bit meh... At the time, I was also thinking hard about what Folda's coat of arms would look like. Didn't want to go with wolf as the emblem again as it's been done a lot, even by me: on the Countess' family arms. Then it hit me while I was browsing my reference image collection: I came across a still of a harpy from Ronja, the Robber's Daughter animated series. This led me to dig up various depictions of harpies, sirens, as well as their descendants: the Russian alkonost and sirin. And this lovely creature solved both the problem of monstrous flyers and the kingdom's emblem! It worked with existing lore and helped shape it further. I love where this faction is going. If you want to see another take on this type of creature in miniature form, have a look at Borgnine's: LINK. His gorgeous converted undead army project has a criminally low follower count. I don't know why, because it's well worth checking out. On the Isles of Brume harpies are birds with no beaks, and with heads that look like womens'. That is why most people believe there are no male harpies, but that is not true. They are simply hard to tell apart, as is the case with most birds of prey. In the kingdom of Folda harpies live on the moor. They build their nests in ruined towers, on top of trees and crags. Based on Stormcast Aetherwings. I bought the kit primarily for the birds, and was pleasantly surprised by how big they were. Perfect. As for the heads, looks like I found a use for those microscopic Escher ganger faces! Had to change the way they were fixed to their bases. Originally they were cleverly attached via ribbons tied to their legs, but that would not work for my conversions. These harpies are not trained pets, but wild raptors. These are amazing - by far the best harpies I've seen! 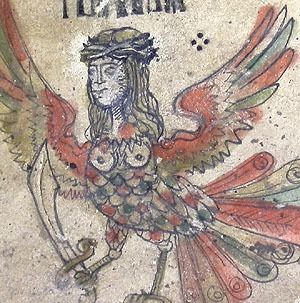 When I was reading the blog, I thought that the first harpy image was yours, but that the second must be from a genuine manuscript - so bravo! Very evocative! Reminiscent of Gustave Doré's harpies from his Forest of Suicides engraving in Dante's Inferno. Cheers! That's a beautiful illustration. Now I want to make some eerie tree people as well. I actually thought faux medieval art was genuine medieval art! The bird things are creepy and very cool. They look amazing, dark and menacing! This scale and size fits them well - as well as those heads. Do they come with those hair, or did you sculpt them? Because they also look great on them, black and stringy. Those dried up trees look really good as bases too! Thanks! :) The hair is partly some random hairlike bits from my bits box, partly sculpted. Amazing work. Love the paint job. They are beautiful. Really inspired work. Those are really great harpies! I like that they do not read as "bad", the ambiguity I think makes them more like a natural creature. And the art is amazing, you should certainly do more. Yes, stunning work. I really thought the drawings were medieval, particularly the second one (I think your trademark cream or white "spatter" gave the game away on the first). Got to say your background fluff is marvellous too, it reads as real history. As I saw the paintings first, I wasn't sure if they were made yourself or copied from somewhere. Not that you wouldn't be able to do them, I just thought it wasn't necessary to do such an effort before i read about the coat of arms for Folda. Absolutely amazing work. The way all the pieces blend in, the poses, the feathers... oh, those feathers! Besides, the medieval art looks great, completely believable. Huge bravo! These are fantastic! I really wish GW sold those Aetherwings separately, because I've no use for the dudes who come in the box, but the birds are awesome. Great use of the Escher heads as well, and you've done a wonderful job of keeping them supported while still looking like they're actually free-flying. Like others mention, I thought at first that those were genuine historical drawings that you had used as inspiration. Cheers! Yeah, it would be great if they could be bought separately. Luckily for me I use sigmarines for conversions a lot, so that part of the box won't go to waste. Beautiful. I find your work so inspiring. Fantastic and again, inspired/inspiring. How do you do it?! AoS28 has nothing to do with Middle Ages. Lol...........so what if it doesn't? Inspiration can be taken from anywhere. Don't bother, Michael Caine. Dear old Hagen is on some kind of crusade against AoS, and comes by the Gardens every once in a while to passive-aggressively express his disdain for my work. Oh dear. Well, theres plenty of us that support you, in spite of the Rage of Sigmar team being negative about everything. Brilliant. Very reminiscent of Classical (Greek) harpies (for me anyway) and made me think of Jason and the Argonauts (movie) (I don't know why though, because those harpies had bat wings!?). I like the artwork, I would have thought it was actual medieval art without closer inspection!